The poster proudly proclaims that Skate Kitchen stars “The Skate Kitchen and Jaden Smith”. Of course we all know the latter name, after Will Smith has put so much effort into making his family more collectively famous than many religious figures. But who or what is “The Skate Kitchen”, why is the movie named after them, and why should we possibly know who they are? Well, the movie was actually written/produced/directed by a documentary filmmaker named Crystal Moselle. In 2016, she was commissioned to make a commercial short film, part of a series that also featured such notable female directors as Miranda July, Chloe Sevigny, and freaking Ava DuVernay. For Moselle’s short, she collaborated with some teenaged skateboarders she met on the New York subway. 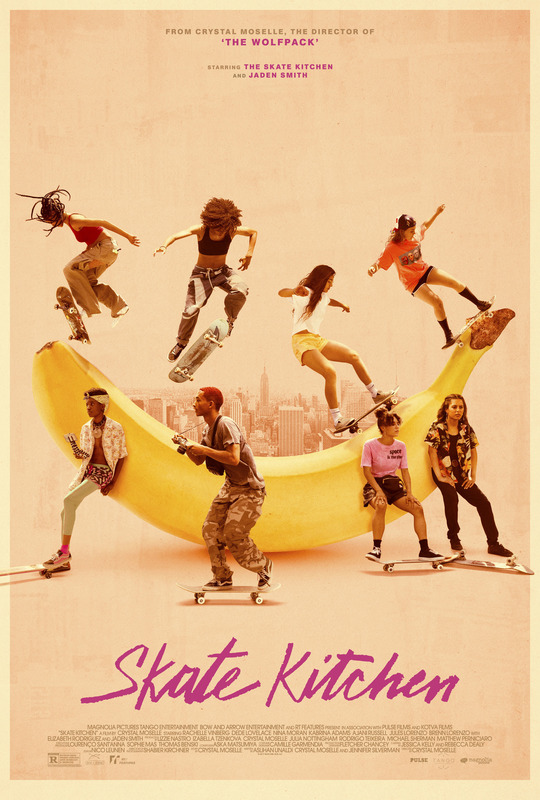 Given that many of those skaters also appear in this movie, I assume that the Skate Kitchen is primarily comprised of Rachelle Vinberg, Ajani Russell, Nina Moran, Jules Lorenzo, Kabrina Adams, and Brenn Lorenzo, all of whom make their feature debuts with this picture. For the Skate Kitchen feature, Rachelle Vinberg takes point in the role of our protagonist, name of Camille. As the plot unfolds, we learn that Camille lived with her father through most of her upbringing as a tomboy, then moved in with her mother (played by Elizabeth Rodriguez) when puberty hit and she needed a female role model. Alas, her father got jealous to the point where he severed all ties completely, and her mother only knew how to raise Camille with a more… *ahem* archaic view toward femininity. As a direct result, Camille has reached 18 years and she’s still being treated like a fragile little girl half that age. What’s worse, she’s been sexually repressed and miseducated to the point where she doesn’t use tampons for fear that they’ll poison her. Camille has no idea who she is or what she’s growing into, just that skateboarding is the only thing that makes her feel truly alive. Eventually, Camille gets in touch with a group of fellow teenaged girls who all share an interest in skating. These are young women who smoke pot and curse with impunity, all while talking freely about their genitalia, sexual preferences, menstrual cycles, etc. One of them (Kurt, played with wild abandon by Nina Moran) is probably the most outspoken case in point, a confrontational lesbian with the filthiest mouth of the lot. Naturally, Camille’s mother doesn’t approve of this new company her daughter is keeping, so Camille packs up to run away and live with another of her skater friends (Janay, played by Ardelia Lovelace). What follows is a coming-of-age story in which Camille gets a job, smokes weed, pushes herself to the physical limit, and discovers who she is at 18. All throughout the movie, there’s the subtle recurring theme of pushing limits. Whether it’s defying authority, trying bigger stunts, attempting romantic or sexual contact, or challenging others to try something new, there’s always the question of how far is too far. It’s all about finding that limit just beyond the comfort zone, where personal growth is possible without making injury or death inevitable. Flying toward the sun without ever getting too close. But then we have what passes for the central conflict, as Camille and the rest of the Skate Kitchen has to try and carve out a place for themselves in the male-dominated skating culture. This conflict between the male and female skaters finds a focal point in a love triangle, as Camille starts getting friendly with Devon (Jaden Smith), an ex-boyfriend of Janay. The plot more or less follows Camille as she bounces between the two different sides of this gender war. All the while, she’s trying to figure out whether she identifies more with the boys or the girls, which ones she’s most attracted to, and which ones will take her in. She has to find out who she is before she can find out who her people are. It’s interesting to note that the movie begins with Camille injuring her groin in a skateboard accident — later on, Kurt eloquently describes it as getting “credit-carded”. While it’s never made explicitly clear, I respectfully submit the possibility that Camille broke her hymen in that accident. That would open up so many layers of symbolism, I’d need a whole ‘nother blog entry just to unpack them all. In summary, it would mean that this whole movie begins with an event that perfectly encapsulates the two most prominent themes — breaking one’s self in pushing limits, and sexual awakening — in a creative and authentically bloody way. So really, it would sum up the whole film perfectly. This movie has a lot to say about coming of age, living as a girl in a man’s world, growing up in a day and age when sexual norms are becoming more fluid, and trying to outperform everyone else when anyone can post their pictures and videos online. I also found the characters to be endearing, with performances that were nicely authentic. It’s really kind of a shame that Jaden Smith is in the cast — against all the genuinely talented first-timers who dropped in out of nowhere, the world-famous-since-he-was-born Smith couldn’t look more out-of-place if he tried. Oh, and bananas are used as a recurring motif. There’s even one split-second moment in which a banana segment is used as a bong. I don’t know what that’s about, but it looked cute. But of course the movie has a few tiny, niggling problems. Nothing major, just little things like… well, you know, the whole plot. It doesn’t necessarily bug me that this is a movie without a traditional three-act structure. Eighth Grade was another coming-of-age story without a rigidly structured plot, and that worked out fine. But at least that movie had a defined endpoint that it was constantly moving toward, where this film really doesn’t. As a direct result, Camille just kind of drifts along through one status quo until some plot point comes along to shake her into another status quo. The plot moves in fits and starts, as a whole lot of nothing happens in between massive shakeups. This is most especially obvious at the ending, when Camille spends a long stretch of time looking back at all the mistakes she’s made. Thirty seconds later, everything is resolved all nice and tidy while the climax happens more or less entirely offscreen. Oh, and you know that dated godawful cliche in which the protagonist keeps a secret, the other supporting characters find out, then it’s all “You lied to me!” and the protagonist is ostracized? Yeah, that’s something like two-thirds of what passes for a plot here. And the other third is Camille looking for a new place to stay. The camerawork is just as uneven, I’m sorry to say. When the characters are skating, it’s portrayed through some masterful camerawork, with expert use of slo-mo and dazzling camera movements. It’s deeply impressive how the camera moves so quickly and smoothly in some shots. But when it’s just the characters talking, the camera moves all over the place and often loses track of what’s being shot, all in a textbook case of trying too hard for “cinema verite”. Skate Kitchen is the sophomore effort of a documentary filmmaker, and it shows. Moselle is aces at making non-actors look great on film and coaxing them into opening up on camera, while using an obscure subject to make bold and heartfelt statements about deeper truths. But as a storyteller, Moselle shows precious little talent at writing or structuring a script, or using the camera to create visuals that advance the story in some way. It’s clear that a lot of talent and effort went into this — all the girls of the Skate Kitchen are charismatic performers, and Mozelle clearly has talent as a director. It’s just a shame that the ideas and themes are so much more interesting than the plot. Factoring in how this is a smaller and more obscure movie that isn’t playing on very many screens, I’m sorry I can’t give this a recommendation. Though it could be worth a try when it comes to home streaming. 63 mySQL queries in 0.241 seconds.